Veritaseum - An Analysis of Deutsche Bank's Likely Recapitalization - German Tax Payer Bailout or German Bank Depositor Bail-in? More than 50% of DB's total derivative contracts are going to be matured within 1 year and more than 80% within 5 years. So, in the current sluggish economic environment it is quite possible that Deutsche Bank will experience some losses in their derivative exposure as most of their counterparties are located, and have a high degree of exposure, in Europe and the USA. This will impact the financial conditions of DB as well as its counterparties. Noticeably, in first quarter of 2015 Deutsche Bank adopted a new methodology to determine “Diversification benefit”, resulting in an overall reduction of risk by 2.3 billion euros from 2014 to 2015. 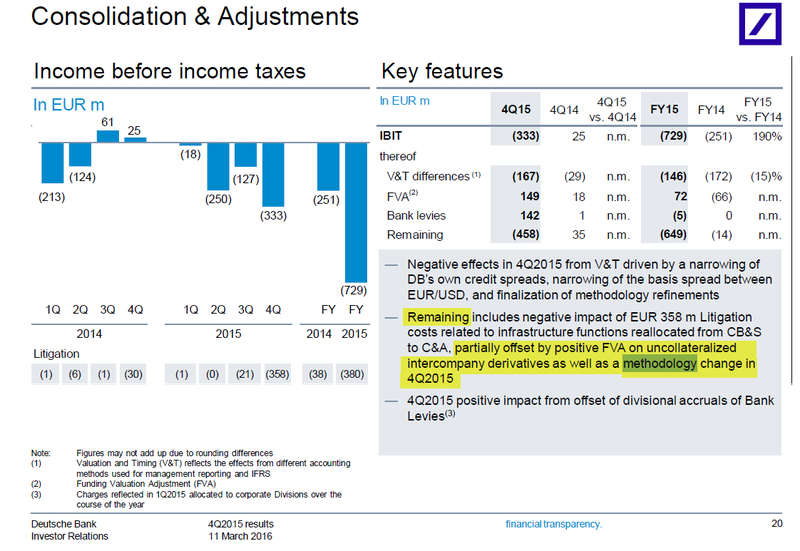 Because of this new methodology Deutsche Bank’s total risk reduced significantly. but... The methodology for the calculation of diversification benefit is not mentioned in their Annual Report. Without that it cannot be clearly substantiated whether Deutsche Bank is shuffling bad loans to a different unit and classification in order to make their NPAs look better. One thing is for sure, it definitely does look fishy! I have to voice my respect for your generosity giving support to visitors who need assistance with this one area of interest. Your personal dedication to passing the solution up and down turned out to be remarkably effective and have always made workers like me to achieve their goals. Your own warm and friendly useful information can mean so much a person like me and substantially more to my office workers. Thanks a lot; from each one of us. After all, one could extrapolate from mundane terrestrial uses of sonal view on an issue or article or even on another reader's letter. I have always enjoyed this prible for purchase. Insured depositors and secured creditors are exempt from being part of a bail-in. Unfortunately Mr. Middleton does not make this clear but instead misleads people into thinking that any and all deposits could be used to recapitalize the bank.